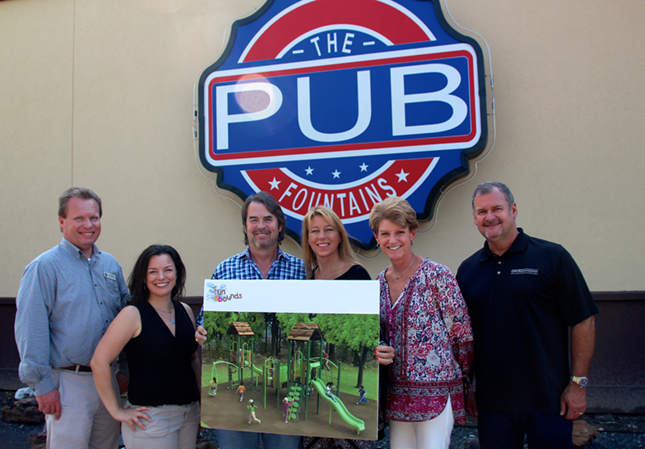 With support from The Pub Fountains, Fort Bend Cares extended its assistance to children and youth in Fort Bend County from financial to physical in the form of a new playground located in Community Park in Rosenberg. The NaturePlay playground designed by Burke for 5-12 year olds, includes slides, climbing features, a sliding pole and more. The new playground, plus a shade structure and benches were formally approved by Rosenberg City Council in June 2015. In consultation with local playground company, Fun Abounds, Inc. and with the help of community members and Fort Bend Cares volunteers, installation of the new playground and related improvements is set for Saturday, October 24, 2015. “While we are proud of the positive impact we have on improving the lives of children and youth in Fort Bend county through our grants to many non-profits in the area, it is great to contribute directly to the health and well being of children in a tangible way through the installation of a playground,” said Angie Wierzbicki, Fort Bend Cares Executive Director. As of August 2015, $56,700 of the $65,300 total cost of the project has been raised through generous corporate and individual donors. For more information about the new playground, or sponsor opportunities, email Angie Wiezbicki at angie@fortbendcares.org, call 832-819-2005 or visit www.fortbendcares.org.